How do climate changes transforming the Arctic affect all aspects of the lives of the people living in the region? And why do the changes being wrought in the Arctic matter to all of us? 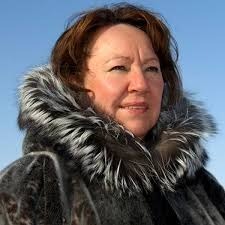 Arctic activist and author Sheila Watt-Cloutier will address these questions in her Nobel Conference presentation. “The future of Inuit is the future of the rest of the world—our home is a barometer for what is happening to our entire planet,” she writes in her memoir, The Right to be Cold. A member of the indigenous Inuit of Arctic Canada, Watt-Cloutier began her career working for social institutions that served Inuit communities. This led to a lifetime of activism and advocacy for the rights of Inuit people, and the realization that the survival of Inuit people and culture is inexorably linked to the survival of their Arctic environment, especially its cold climate. In 2005, Watt-Cloutier presented a landmark petition to the Inter-American Commission on Human Rights (IACHR), arguing that global warming impedes human rights by threatening an entire culture, the Inuit culture. Her petition is widely recognized as pivotal to reframing climate change as a human rights issue. Watt-Cloutier was awarded the Right Livelihood award, often called the “alternative Nobel.” At the heart of her work is her belief in the necessity of shared goals among members of a global society.